Parousia at McVan’s, June 1979 (two shows, Friday June 1 with Rasputin and Monday June 4). This audio track is a cover of the song “School”, by Supertramp, ambitiously attempted by Parousia at McVan’s Nite Club, Saturday June 1, 1979. 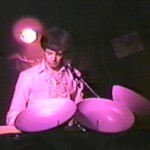 This is one of the band’s earlier shows, experimenting and ‘stretching its wings’ trying to recreate a live version of a heavily produced album track from “Crime Of The Century” using little to no effects, equipment that barely worked and a healthy dose of youthful enthusiasm. 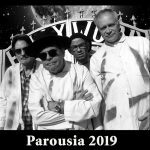 A live audio track from a very young Parousia covering the 1974 Elton John rendition of the song “PINBALL WIZARD” by the WHO, recorded live at McVan’s Nite Club, Monday, June 4th, 1979. Live from McVan’s its the rock band Parousia with a cover of the song, “Surrender” by Cheap Trick recorded June 1979. With musicians: Patt Connolly (vocals); Kim Watts (vocals); Garth Huels (guitar); Barry Cannizzaro (guitar); Dave Maltbie (keyboards); Robert Lowden (bass) and Gerry Cannizzaro (drums). McVan’s holds a special place in my heart and memory, Parousia played there many times with many talented local artists (and like the ‘Gong Show’, some awful ones too). The club was a classic dive in the 70’s. It was a unique place for artists to experiment and get away with stuff a band would not dare to try in more mainstream establishments like After Dark, Stage 1 or Uncle Sam’s. RIP Joe Terose and Thank-You for giving artists a space to stretch their wings! This second picture features Robert “Bob” Lowden and Garth Huels. It may be 1979, but I’m squeezing just a little more life out of my platform shoes! Ah, yes, the Buffalo music scene circa 1979! Rasputin, Buffalo’s Kiss cover band. They weren’t too bad, actually. I see the Tourists, who later changed their name to the 3rd floor Strangers. The Jumpers (featuring Terry Sullivan) were an exciting authentic “punk” band to experience but short lived. Extra Cheese – – was eclectic independent radio personality Gary Storm’s band. Great name! 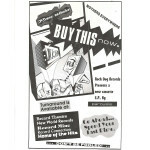 Same thing with Davey and the Crocketts – – was that Pauline’s (of Pauline and the Perils) hubby’s band? John Cale played there in the late 70’s. The story I heard is that he was so annoyed at the flashbulbs he had a hissy fit and busted every lightbulb he could find with the neck of his bass. Lou Gramm of Foreigner played there as frontman for the Rochester-based band Black Sheep. Alex Chilton played there in June of 1979. I’ve heard Frank Sinatra and Bob Hope played there, back in the day. Ella Fitzgerald played there for a couple weeks in 1946. Use to frequent there in the mid 70’s, enjoyed the band Rasputin, they would dress up as Kiss and played mostly Kiss music, I thought they were actually pretty good. JOSEPH TERROSE (1918 – 2011) Joe was the owner of McVan’s nite club located on the corner of Niagara & Hertel in Buffalo, (one block from the Niagara River). During the 1970’s, McVan’s was known as a venue which served as a “launching-pad” of new ideas for rock bands. It was one of the first local clubs to showcase live original music encompassing many genres. At McVans, you could see a punk band on Friday, a progressive rock band on Saturday, a heavy metal band on Sunday and an acoustic act on Monday. In the 1960’s “Joey Dee & the Starliters” appeared there with up-and-coming guitarist Jimi Hendrix. Other historical acts performing at McVan’s: “Art Tatum”, “The Ink Spots”, “Gypsy Rose Lee” and “Alex Chilton”. Also of note: Lou Gramm of Foreigner performed there as front-man for the Rochester-based band “Black Sheep”. Rumor has it that Joe T Rose decided to shut the venue down when one morning he arrived at the club to find his favorite cat bitten to death by a river rat… ’nuff said’. My ex used to play there in the late 70s, I remember the place well. There was a wall covered in signatures of all of the “greats” of the 40s and 50s who played there. By the late 70s the place was so bad – I remember sitting at the bar chatting with the women who ran the place, and HUGE rats were climbing in and out of the trash cans in the bar space. The upstairs was only open for using rest rooms (at your own risk) – the rest was dark. The downstairs/main floor at the time did have a low ceiling and a punk band who played the same bill as my ex’s had a following who would smash their fists into the ceiling tiles as they “moshed”. I actually had to help clean up cat crap from the band stand – cats were “rented” to try and keep the rat population under control, but the rats usually won, cats went missing. But, it was a great scene!! I remember actually walking home to Riverside with Steve Soos (our keyboardist) as well as with my brother Jerry Cannizzaro (our fabulous drummer) one very cold winter’s night all the way from downtown Buffalo after seeing the Led Zepplin movie “The Song Remains the Same” at the classic Century Theater. We eventually came upon McVan’s nightclub corner of Hertel and Niagara streets (RIP Joe T. Rose; owner and manager) and heard what sounded like KISS playing there. Curious as cats (almost like the house cat that lived and died there, or should I say was killed by a huge rat at McVan’s. YEEESH!) we decided to investigate this amazing sound. Climbing the few stairs that lead up to the door we peered through the glass window and saw the KISS tribute band Rasputin doing there thing. I remember that all band members were dressed in mind blowing KISS makeup and garb. I also remember one of the players shaking his amp and seeing smoke come out of it, just like KISS used to do, along with a replica of Gene Simmons sticking his long tongue out and bleeding all over the stage. It was as cool as hell pilgrims! Unfortunately my brother and Steve couldn’t get into the club, because they were not yet 18 at the time; the legal drinking age of that era. We still very much enjoyed the show just listening to it from the outside. Our band Parousia finally made it and played at this historic establishment. In fact we played one night with Rasputin who had just changed their name to “Video”. I fondly remember the two pretty waitresses who were both sisters, as well as the older lead waitress named Bambi, who I believe was Joe T. Rose’s girlfriend. Joe also owned a dry cleaning business which he ran during the day called M&T Cleaners. He was one character and one hell of a guy. He gave so many new bands (including our band Parousia) their “start” in the music business, and some went on to become great stars. One time when we were performing on the main stage (there were actually 2 stages; the main stage and the smaller side stage in which we performed many times opening for many bigger acts: Pegasus, Cheeks, Aunt Helen, etc.) I remember Alan Swan, one of our devoted fans screaming loudly in adoration after we performed Suffragette City by David Bowie. I asked him afterwards why he got so excited over it and he said he never saw anyone’s hand move so fast as I was playing the E chord steadily with several beats before shouting the final word, Suffragette! Thank God he never caught me in the bathroom saying hello to “Rosie, and her five skinny sisters”; because that would have answered his question. TEE HEE! What can I say, us musicians all have our own technique building skills if you get my drift players! Everyone hung out at McVan’s, including my cousin Phyllis who was an avid 70’s party gal from way back. That place had so much cool history behind it. It was an awful shame (or maybe actually it was a fitting tribute to the place) that when it closed down and was being demolished by bulldozers; rats were actually climbing all over the steam shovel. Perhaps the rats were actually reincarnated souls of all the fantastic musicians that played there (aka: Jimmy Hendrix; no disrespect intended by any means) trying to put a stop to its finality and most certain demise. Man do I have a twisted imagination or what! Rock on in rock’n roll heaven McVan’s, and of course, Joe T. Rose! Here is the thing about the basement at McVan’s. Seeing that Robert, Kim and I had nothing to do before the show, Kim convinced Robert to pick the lock on the door to the mysterious basement, which we had heard held victims of Gangland slayings, Joe T’s various x-girlfriends and a colony of genetically altered super river rats as big as dogs. It was Robert who dared to venture down the “stairs”, so filled with debris that they were more of a ramp. Kim followed, as did I, but not to close for fear of discovery. There was actually a light switch, which revealed piles of paper, masonry, costumes from the 50’s and 60’s and one very damaged upright piano, somehow thrown down the stairs. By that time, Robert began to freak out, letting his imagination run away from him, and we hightailed it out of there, before some spirit or rat had his way with us. one of my favorite McVans moments was talking to Joe T in the kitchen about how he needed to pay the bands more $$. His response “You’re too cheap”. He was spray painting regular light bulbs with red paint at the time. he also said “you guys gotta play half originals and half cover.” I replied “I don’t tell you how to make your bar stink; Don’t tell me how to run my band.”. …That singer always reminded me of Ian Curtis. Pinball Wizard! I remember seeing them do this !! Saw Triumph rock the rats to the river !!! I might be biased; but I feel that this is an excellent rendition of the song “School”, lead vocals sung by “yours truly.” Our old “late” girl singer Kim Watts did a real “bang up” job playing the harmonica which opened this song. Very impressive harmonica playing indeed. God rest your soul Kim. God Speed to you. R.I. P. The rest of the band were “spot on tight” playing all their parts also. The crowd seemed to really enjoy it. We enjoyed playing for everyone. Such magical times. Those were the days my dear friends. Seasons Greetings to one and all ! Peace out and keep on rockin’ ! A good place to cut your teeth, or try something new and experimental. Or to see other bands and think, “at least we’re not THAT bad” 🙂 And to occasionally see something amazing. That was the coolest thing about McVan’s David; is that they gave any band a chance for their “start” in the music business. Many other places would not. If you did a good job at McVan’s; there would then be a chance that you would be “on your way making a name for yourself.” I and my old band Parousia are eternally and extremely grateful; thankful; and appreciative to the “late” Joe Terose for giving us our “start” there. God rest his soul. R.I.P. Joe ! Had a lot of fun there…..